Mobile Tactics is a mobile/transportable firing range that can be delivered to your location. Our range provides an alternative approach to live fire and simulation training. The range has the decision making CAPS system available and provides the closest similarity to actual linear encounters anywhere, with little to no modification. The ability to train your personnel for hallways, trains, buses, and airplane encounters is unbeatable, short of being actually in the conveyance itself. Mobile Tactics is a ballistically secure trailer, allowing the firing of pistol, shotguns, and rifles up to a 30-06 SPG. We use a state of the art target retrieval system developed and installed by Action Target. 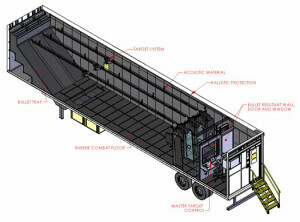 This target retrieval system, along with the CAPS system provides all of the options, from decision making, to weapons qualifications. The ability to make decisions with live fire scenarios instead of lasers or video type systems is crucial when looking at liability concerns regarding training. In addition training can be conducted in a fully lighted environment as well as no light and low light environments. Whether you need a solution for marksmanship training, decision making, shoot/don’t shoot, or tactical training, Mobile Tactics is the solution, which comes to you. We believe that firearms training must be realistic and provide the shooters with the ability to train as they need to perform, whether for their job, or simply self-defense. So if you need experienced and trained professional instructors Mobile Tactics can also provide the staff to meet your needs for your training. Your Gun. Your Ammo. No Excuses. We don’t simulate, we prove. Deadly force decision-making is a two-part process involving both judgment and fire-arms skills. 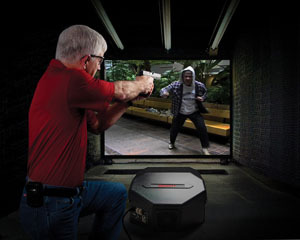 Any video simulator can prepare you for the first part but only a live-fire system can prove your competence with the weapon system and ammunition you carry on the job. Firearms training isn’t a video game. Pretending with laser-firing weapons that simulate recoil gives no indication of your ability to hit hostile human targets with live ammunition. In fact, trainees exposed only to simulated firearms attempt shots on the street that they don’t have the live-fire skills to accomplish, putting themselves, the public and their agencies at risk. 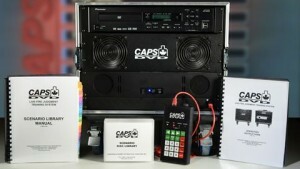 The CAPS DVD system combines the two-part decision-making process into dynamic skill-building training, replicating as closely as possible the realities faced by those who go in harms way. The guns are real, the ammunition is real, the distances are real and the people on the screen are real.